When i create shift+a Text (C:\Windows\Fonts\) , Blender can not see all fonts. Only windows default fonts. In User preferences i have set to Windows/Fonts folder. Blender see only default fonts. All font blender dont see is ttf format. Check the font-type (file extension) which Blender does not see. Try turning off the file-type filter (at the top right). Try uploading a file from another directory, not Windows/Fonts. 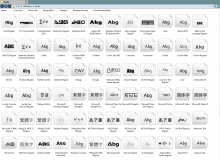 It may also be that the fonts you see in Windows Explorer (Fonts folder) are actually in a different folder! Check it. When i select a different font directory (no windows/fonts) Blender see all the fonts, both TTF and OTF format. And loads them without a problem. When i right click on a font (which the blender can not see in the windows/Fonts directory) and click install (or install for all users) font appears in windows/fonts directory but blender do not see him. But in different directory he sees without a problem. 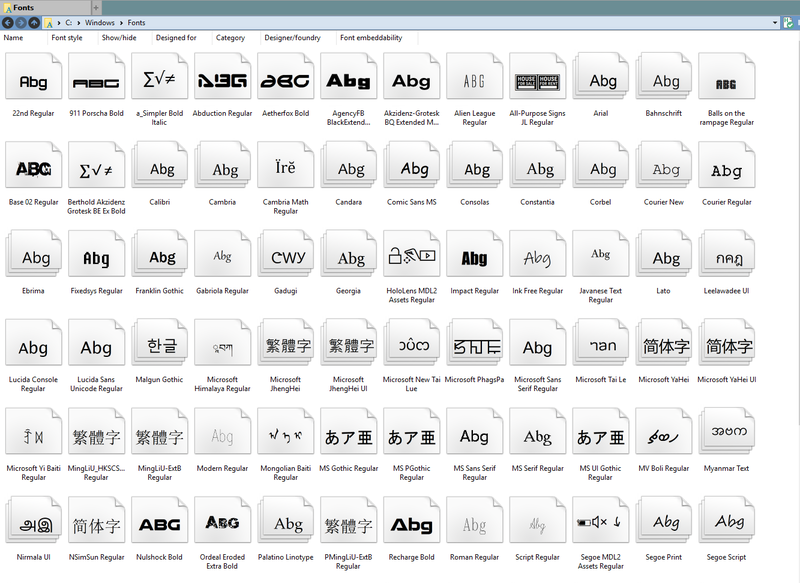 All installed fonts are in Windows/Fonts directory. 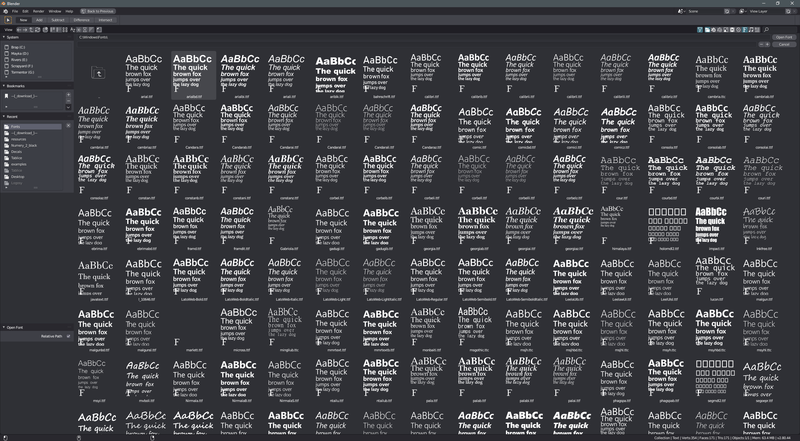 Personally, if the blender sees all the fonts in a different directory, this is not a problem for me. I think when you install the font, it is not real copied to the Windows/Fonts directory, it is only "linked". Other programs see those fonts without problem. Does it list the fonts that you have installed? It should list files that are linked and not actually in that directory. Do they show up (the missing fonts) if you simply do dir C:\Windows\Fonts\ ? Yes they show up (default fonts). But without those missing by blender fonts. So You are right fonts are linked and not actually in that directory. @Brecht Van Lommel (brecht) I'm guessing this is not something we plan to support for the 2.8 release?